Saturday November 7 saw the official launch party for All Hopped Up and Ready To Go: Music from the Streets of New York 1927-77 in my new hometown of Woodstock, a location that was rendered perfect by the presence not just of so many friends for the party but of several musicians I interviewed for the book. To celebrate the launch, Tommy Ramone (the Ramones), Elda Gentile (Pure Garbage, the Stillettoes), Eric Weissberg (the Tarriers, “Duelling Banjos”) and Fred Smith (The Stillettoes, Blondie, Television) all joined me at the Kleinert/James Arts Center on Tinker Street for an hour-long panel discussion on the New York City music scene. It was enormously entertaining, and though we knew all along that the party was limited to two hours due to a concert at the Kleinert that evening, I can only apologize that we weren’t able to keep the discussion going longer. We were, however, able to film it and I hope to get that footage up online soon enough. In the meantime, my sincere gratitude to Tommy, Elda, Eric and Fred for taking part. 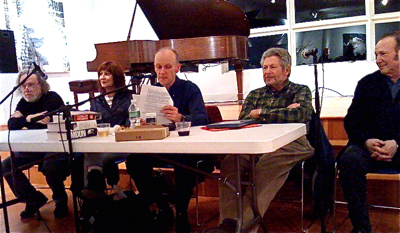 Tommy Ramone, Elda Gentile, yours truly, Eric Weissberg and Fred Smith discuss NYC in Woodstock. 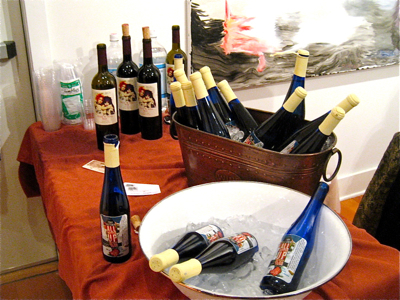 Thanks also to Fred and his wife Paula Cereghino for supplying one of the wines for the occasion. I am long due a proper post on Cereghino Smith Winery, which is based just down the road from Woodstock, in Bloomington, where they blend Californian grapes and the occasional New York State Cabernet Franc in their custom-renovated barn. 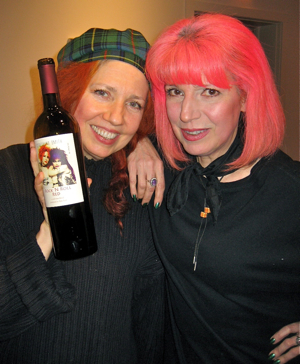 Cereginho Smith’s flagship wine is their Rock’n’Roll Red – a Super Tuscan style blend of Sangiovese, Petite Syrah, and Cabernet Franc – which carries as its label an image of Tish and Snooky who, prior to founding their highly successful make-up company Manic Panic, were members of an early version of Blondie; they also had their own act in the glorious CBGBs punk days known as the Sic Fucs. Tish and Snooky graced us with their presence (and their kids) on Saturday, allowing me the long-awaited opportunity to photograph them holding a bottle of the wine that carries their image. As you’ll note, they continue to look as young – and as punk – as ever. Kudos and good health. Our white wine for the event was a sparkling Gewürztraminer (no, I’d never tasted one before, either) courtesy of my new friend Kenneth Lipshitz of Silver Stream Winery in nearby Monroe. Ken kindly made up a souvenir label for the occasion; you can imagine that for me, a long-standing wine geek who occasionally dreams of bankrupting himself by going into the wine game for a living, this was something of a dream come true. Thanks, Ken. And the food for the event was all vegan hors d’oeuvres supplied by Gabriel’s of Kingston, including miniature foccacias, stuffed mushrooms, and African falafel. As I suspected, the food went in minutes – which is why I won’t apologize for bringing a plate of it up to our panel table and eating during the discussion. It was too good to leave. As I noted in making my introductions, quoting from The Face On Our Plate, “The most inconvenient truth of them all is the effect that eating meat and other animal products is having on our planet.” Gabrielle’s helped demonstrate, once again, just how delicious vegan food can be. Thanks to my publishers W. W. Norton for offering to pay for food and drink. Special thanks to the Golden Notebook of Woodstock for paying for the balance and for hosting the occasion. Thanks also to our thriving local media for promoting the event and/or reviewing the book. There’s a full-page feature on the book in the current Woodstock Times, a full-page review in the October Chronogram, the book cover is featured in full color on the cover of the current Phoenicia Times/Olive Press, and both WDST and WKZE had me on air in recent weeks for interviews. The panel concept is a popular one with bookstores, and I can see why. Who wants to listen to me talk when they can listen to the people I write about? So NYC readers should be pleased to know that we’re doing much the same again – absent the food and drink, I’m afraid – at Barnes & Noble’s Lincoln Triangle store (66th and Broadway) this Friday the 13th, at 7:30pm sharp. This discussion will include the great Arlene Smith, original singer with the Chantels, without whom it’s hard to imagine the girl group sound of the sixties; Peter Stampfel of the Fugs and Holy Modal Rounders, without whom the progression from folk to rock might have sounded very different; and Danny Fields, without whom the story of modern rock’n’roll might not have even existed. (Fields signed and/or managed David Peel and the Lower East Side, the MC5, the Stooges and the Ramones.) I’m hoping that Seymour Stein, without whom it would have been up to someone else to sign the Ramones, Talking Heads, Richard Hell and others, will also still attend. Get there early – and please note, book readings are not rock’n’roll shows: they start on time. We’re doing something similar at the Strand Bookstore on lower Broadway on Wednesday November 18th with the inimitable Jim Fouratt. 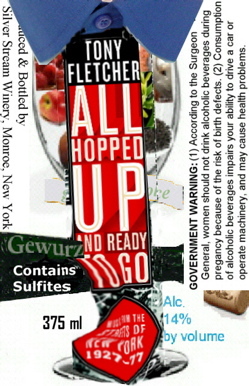 I’d like to encourage you to purchase All Hopped Up and Ready To Go from your local book store if possible: in a recession, it’s important to keep our money in our communities. However, the book is also readily available from amazon.com, and barnesandnoble.com, with all the conveniences those sites provide. I’ll point you back to the iJamming! resources for the book as soon as the site is re-installed (fingers crossed). Finally, to the young woman who asked a question of me as the panel discussion was breaking down, the reason that the British version of All Hopped Up won’t be longer than the American edition, as per Simon Reynolds’ Rip It Up and Start Again, is as follows. In Reynolds’ case, the British publishers printed his full manuscript; the Americans then decided to edit out some chapters, to bring it under their dreaded 400-page threshold. In my case, the book, as it stands in the States, is already a hefty 456 pages; Omnibus Press in the UK will be publishing the exact same edition. While I indeed had to edit out a considerable amount of material, I accept that the book is stronger as a result, and thank my editor Amy Cherry for her endeavors in that regard. As time allows, I will possibly post some of the edited material online. Thanks for caring enough to want to see it.